BMW has officially unveiled the M4 GTS ahead of its debut at the Tokyo Motor Show. 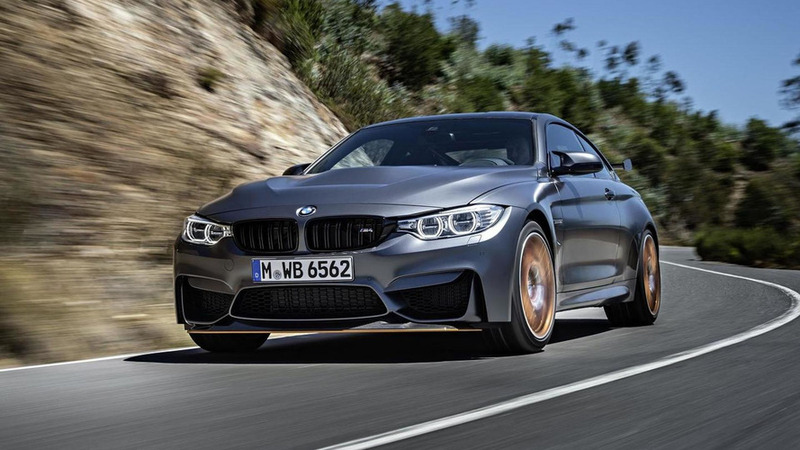 Described as an "exclusive technological showpiece which elevates the potential of the BMW M4 Coupe to another impressive new level," the M4 GTS features an aggressive aerodynamic body kit that includes an adjustable front splitter, a new hood and an adjustable rear wing carbon fiber rear wing which has CNC-machined aluminum mounts which are connected to the car's carbon-fiber-reinforced plastic (CFRP) trunk lid. The special edition also features a carbon fiber diffuser, a titanium exhaust system and exclusive M light-alloy wheels with Michelin Pilot Sport Cup 2 tires. Last but not least, there's LED headlights and OLED taillights - a first for a production vehicle. The interior echoes the standard M4 but it features an Alcantara-wrapped sport steering wheel and carbon-fiber bucket seats (M sports seats in North America) which are upholstered in exclusive Alcantara/Merino leather. Elsewhere, there's three-point seat belts, a lightweight centre console and revised door trim with pull loops that replace the door handles. The rear seat has also been removed and replaced by a glass-fiber-reinforced plastic (GFRP) shelf and a rear panel which are both covered in Alcantara. Customers will also be able to order a Clubsport Package which adds an Acid Orange roll bar, a six-point harness and a fire extinguisher. Power is provided by a 3.0-liter TwinPower Turbo six-cylinder engine which has been equipped with water injection technology. It enables the mill to produce 500 PS (368 kW) and 600 Nm (442 lb-ft) of torque. The engine is connected to a seven-speed M Double Clutch Transmission (M DCT) which enables the coupe to accelerate from 0-100 km/h in 3.8 seconds before hitting a limited top speed of 305 km/h (189.5 mph). BMW also revealed the M4 GTS managed to lap the Nürburgring Nordschleife in an impressive 7.28 minutes. Speaking of performance, the car also features carbon ceramic brakes and an adjustable M coilover suspension. Production will be limited to 700 units but there's no word on pricing.